Lance made by: My brother and me with drilling help from my Dad! Realized I only have a couple photos in my gallery of my 'updated' Fang costume so here's two in one! Actually I got a bunch of Fang photos back from Fanime (plus an amazing shoot with one of my favorite photographers) so I'll have a ton to upload (sorry? lol). Newer upgrades since ALA: new small buckles, new contacts, drew my tattoo and brand on instead of using tattoo sheets, new smaller belt for the fox tails, and I can now fold my lance blades out without it falling apart thanks to some added screws! Was going to say this is my last upload until after AX because I have SO much to do (haven't even started on my one new costume for the con) but the costume contest for my Babydoll costume is in one week and I'm doing a photoshoot with my friends right after so hopefully I can share one of those photos when I get back from the shoot! perfect! best Fang cosplay I've ever seen! What did you use to draw your tattoo and Brand on with? I was wondering what I could use for my own cosplays. cuter face and better than the original Fang. Excellent job! OMG!! !..this is sooo awesome..kupo..you look GORGEOUS! You've got Fang's stance and attitude down pat! Very cool! Hey, you have a new fan now. lol!!! Thats me! lol!! XD Thanks so much! I think I'm in love with your face, it's what really makes the cosplay so wonderful. You do indeed make a fantastic Fang. I look forward to more pictures. You're definitely the best Fang cosplayer I have seen. Really. hehe you're too kind! (: Thank you!! <3 oh wow thanks so much!! man i love your costumes. too bad you're prolly not from my area. I've been trying to get my fellow art students to do a sketch day where we do character sketches and we all dress up in costumes and take turns doing poses. this would be awesome to see in that. Beautiful and awesome as always!! You seriously look like Fang! <3 aw thank you so much, such a nice compliment!! You should be proud of yourself Callesto because your cosplay of Fang is super good. I can't express that enough . Hard work does really pay off. Keep it up the good work! haha Thank you! This costume sure was a beast to work on, I'm forever remaking things lol! you're so super cool OMG >.< I love your fang costuummee! Are you going to AX agian? haha thank you!! Yes indeed, I'll be at AX! And you? Going to the FF gathering? 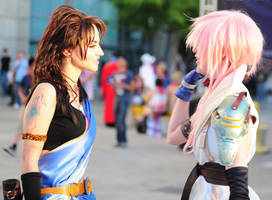 For the FF gathering I'm going to be Wedding Yuna from FFX just like I was most of Fanime lol.